We are all looking to score better on the golf course. Whether you are trying to break 100 or actually looking to score under par, cutting shots is probably at the top of your list of priorities. Of course, everyone has advice, from the club pro down to that guy you bumped into last week who has never actually played! The thing is, all this well-meaning advice can lead to more confusion than anything else. In fact, it might even make you score worse! 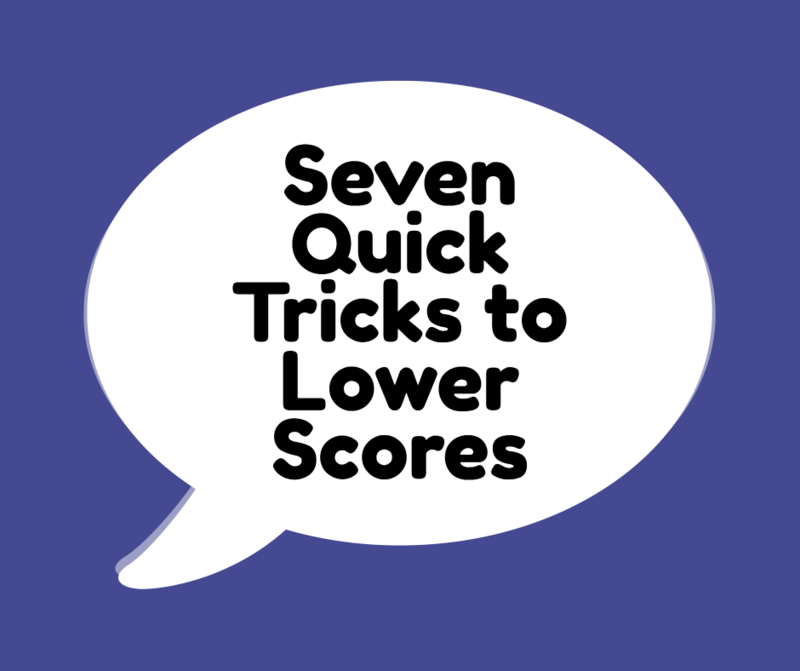 don’t panic, we are here to help:) Here are seven things that you can do right now to help you to a new lower score. 4 How Should You Organize Your Practice Time? Whilst there are many ways to play good golf, it is worth spending a bit of time on everything from stance to posture. Taking the time to get this right simply removes one of the big variables in the golf swing. It also means that your game will hold up far better under pressure. Even if you don’t associate your quest to break 80 with the pressure of playing tournament golf, it is certainly enough to affect your game. Whilst it is easy (or at least easier) to hit that baby draw down the middle when nothing is on the line, it gets a whole lot harder when you need to hold it together for a new pb. Although I love watching the pros play on tv, one of the big problems with this is that we lose the notion of distances with each club. There are only so many times you can hear ‘and here is Mickelson 200 yards out and that looks like an 8 iron’ before you start to believe the hype! Look, maybe it is really a seven iron. Maybe he is ‘only’ 180 yards out and maybe it is downhill with the wind behind. Anyway, you need to forget the distances that pros hit the ball, it really doesn’t matter to the rest of us. Knowing how far most amateurs really hit it is reassuring. It is ok hitting an eight iron 125 yards. Far better to swing comfortably and get this distance every time than think you need to live up to the pros. The real key is knowing the distance you need to hit it (this is what rangefinders are for!) and be able to do it consistently. Many of us expect to hit every shot perfectly and are surprised when this doesn’t happen. Think about this: Ben Hogan, perhaps the greatest ball striker ever, said that he only only expected to pure a shot or two every round! Now his definition of puring might be a bit different to yours or mine, but it goes to show. Golf really is a game of misses and the sooner you learn to accept that most of your shots are going to be less than perfect, the easier it gets to deal with them. 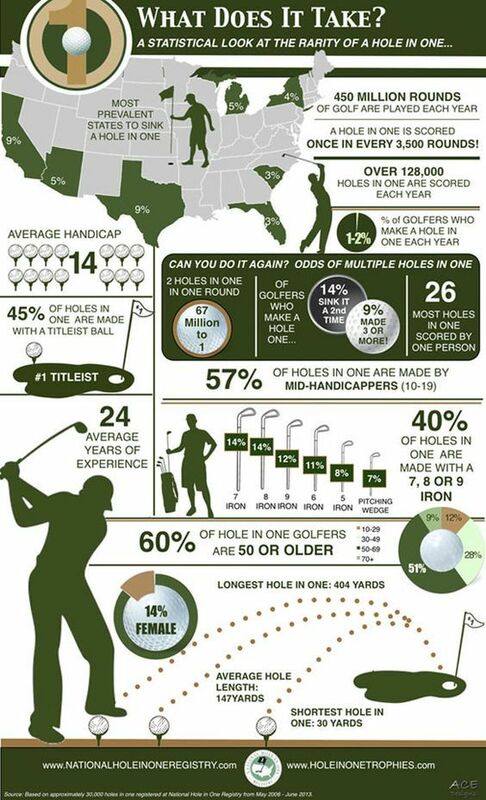 Looking at how unlikely it is to make a hole in one should give you some idea of just what we are up against every time we play and set expectations accordingly. How Should You Organize Your Practice Time? Improving at golf isn’t just about more practice. The key is to practice better. Hitting endless balls on the range without any thought as to what you are really doing is a quick way to ingrain bad habits. The real trick is to make everything you do part of a bigger plan to improve. So how do you go about this? Make your practice varied and have specific aims in mind. Don’t just hit your favourite shots. If you really struggle with chipping and pitching, spend your time on the practice green rather than trying to bomb driver over the back fence! It is often said that the short game is the key to a good score. The truth is a little more complex than that, but without a doubt good putting can make a real difference to your card. so what should you do? Cross your fingers and hope that everything drops? Putting practice is much like anything else. If you spend a bit of time doing it properly, it will pay dividends. Custom fitting in golf is something that divides opinion. some say it is essentially, others fairly unimportant or even a waste of money. One area where it can make a real difference is on the greens. In fact, it doesn’t even need to be a full custom fit. Knowing your stroke and getting a putter that suits your putting style will make this particular part of the short game far easier. When you look at the modern pro, they really are athletes. Much off their time off the course is spent working out with trainers and keeping a close eye on their diets. For most of us, we probably don’t need to take things quite that far (unless of course, you want to!) but without a shadow of a doubt, a basic stretching routine will help you play better and recover more quickly. It can also give you more distance off the tee, which is never something to refuse! Shooting lower scores really isn’t that complicated for most golfers. sure, if you are looking to move into sub-par rounds, life gets harder. However, for the rest of us, there really is quite a lot of areas that will lead to improvement. If you are prepared to spend a little time focusing on both your equipment as well as how you practice and play, better scores should follow fairly quickly. Please give these ideas a try and post in the comments to let us know how you get on. 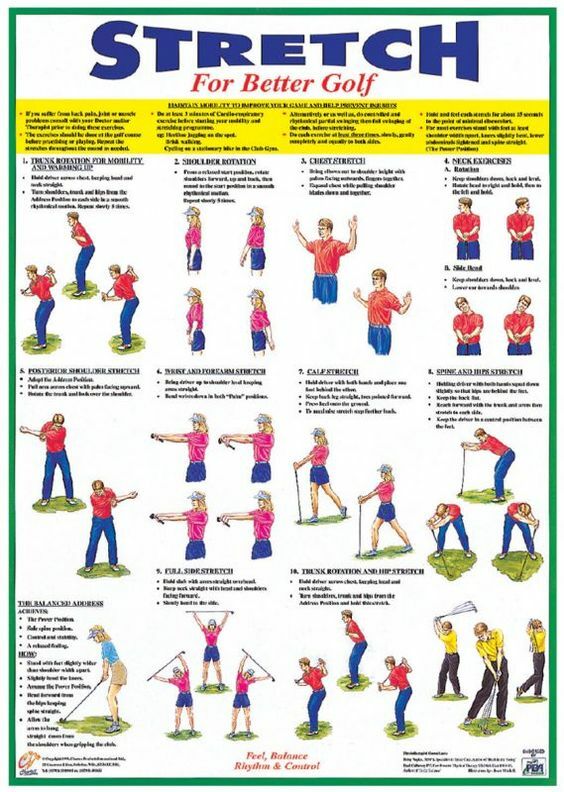 I would like to see more stretching and exercise for senior golfers for strengthening. It’s always about young golfers who can move freely..senior golfers have quite a few body issues and can’t do the ground training…would appreciate some advice on finding that..
Hi Shirley and sorry for the slow reply-your comment seems to have been caught up in the spam filter. I am actually working on some new content currently, including something on ways to keep enjoying the game as we get on a bit, including dealing with body issues. I have been struggling with a herniated disc this year so it is something close to my own heart!